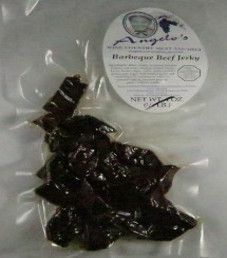 The next review on Angelo’s beef jerky will be on a 2.1 ounce/60 gram bag of their barbecue flavor. 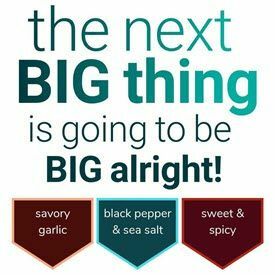 This jerky was kindly submitted by Angela Dellinger, a daughter of the owner Angelo Ibleto. 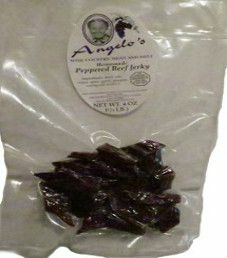 The next review on Angelo’s beef jerky will focus on a 2.1 ounce/60 gram bag of their peppered flavor. This jerky was kindly submitted by Angela Dellinger, a daughter of the owner Angelo Ibleto. 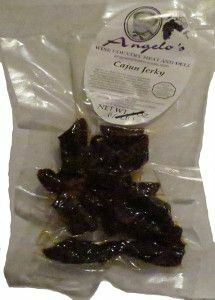 The next review on Angelo’s beef jerky will focus on a 2.1 ounce/60 gram bag of their Cajun flavor. This jerky was kindly submitted by Angela Dellinger, a daughter of the owner Angelo Ibleto. 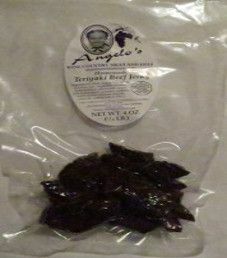 The first review on Angelo’s beef jerky will focus on a 2.5 ounce/71 gram bag of their teriyaki flavor. This jerky was kindly submitted by Angela Dellinger.